Picky eaters—we've all heard the term and many of us have at least one at home. Our littlest diners can be tricky to cook for, especially when trying to make sure they get the nourishment they need. These kid-friendly recipes for tasty breakfasts, lunches, dinners, and snacks are great for family members of all ages. Even your pickiest of eaters are sure to find something new here to love! 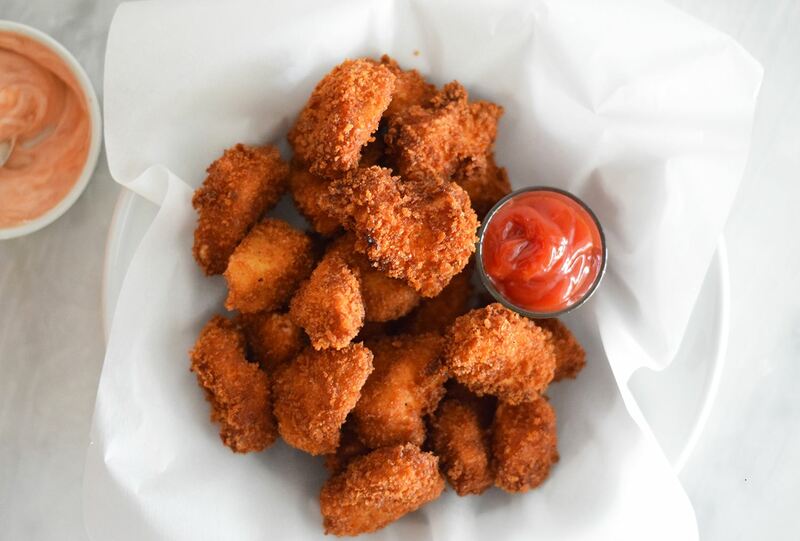 Do your kids love fast food chicken nuggets? Here's an easy recipe that lets you make a healthier version at home with the same great crunch and meaty taste. Chicken chunks are dipped into an egg-and-butter mixture, then coated with seasoned breadcrumbs and baked in the oven until golden brown. Also called "toad in a hole," this fun breakfast gives kids an eggs-cellent protein boost to start their day. Get the kids to help make this recipe—they can do everything from cutting shapes in the bread slices to cracking the egg and sliding it into the "basket." These homemade pancakes are a great way to sneak fruit into kids' breakfast and have a delicious apple pie flavor that children love. For an extra treat, serve them topped with warmed, store-bought applesauce. Everyone loves chicken pot pie, but some recipes take a lot of effort to assemble. This easier, family-friendly casserole version cuts down on prep time by baking biscuit mix right along with the nutritious chicken and vegetable filling, so you don't have to make a separate crust. The whole thing is covered with cheese, for gooey topping kids love! Treat little ones to these tasty breakfast bites that taste like a frozen yogurt dessert, but are secretly good for them. They're made easily by filling muffin tins with healthy fresh fruit, Greek yogurt, and cereal to create a granola-like parfait that you pop into the freezer to create perfectly-portioned bites. Kids will ask for seconds of these French toast sticks flavored with cinnamon and vanilla. The recipe makes a large batch for easy breakfasts throughout the week. Just freeze portions in plastic bags for reheating on the griddle or in a toaster oven. Serve with maple syrup. 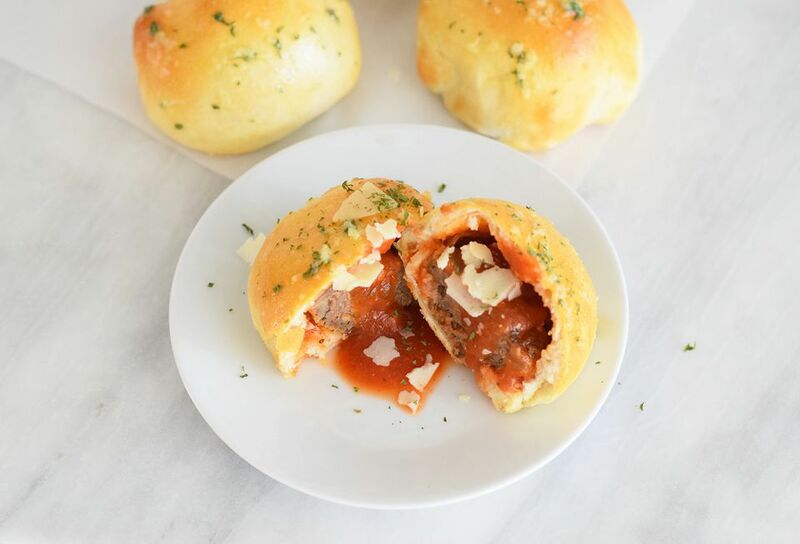 Cheesy meatball "bombs" are basically a meat and sauce-filled snack that can easily replace frozen pizza rolls. Refrigerated biscuit dough is used to form the buns and you can bake the seasoned Italian meatballs from scratch with the recipe included or use pre-cooked frozen meatballs. This ham and cheese quesadilla is the perfect cross between a cheesy grilled ham and cheese sandwich and the classic Mexican dish. They're also baked rather than fried for a healthier lunch or after-school snack. Tomato soup is right up there with chicken noodle as one of the most kid-friendly bowls. This essential recipe is bursting with tomato flavor, silky smooth in texture, and not complicated by too many ingredients, though it does sneak in some extra carrots—kids won't be able to taste the difference. Kids will flip when you serve up these super awesome mac and cheese sammies! Just five ingredients are needed to make a genius lunch that combines America's most popular cheesy pasta dish with kids' favorite grilled cheese sandwich. Classic chicken noodle soup is like a big, warm hug for kids' stomachs. You can pour it into a thermos for warm and comforting school lunch, or serve it with crackers and cheese for a light dinner. This version is made from scratch, so allow time to cook the chicken. These twice-baked stuffed potatoes with cheddar cheese, bacon, and green onions are always a hit at lunch or snack time. You can vary the toppings with your family's favorite ingredients or add some browned ground meat to the filling to bulk it up for dinner time. Vegetarian kids will love the hearty flavor and texture of this bean and corn chili topped with crunchy corn tortilla strips. Parents will love how quick and easy it is to make, with mostly canned ingredients. Omit the cheese and optional sour cream topping if you need it to be vegan and dairy-free. If your kids enjoy fish sticks, this baked recipe is a great way to get them to eat healthier. Fresh or thawed frozen fillets are coated with a Parmesan cheese and seasoned breadcrumb crust, drizzled with a little melted butter, then baked to crunchy, golden, flaky perfection. Kids will cheer for this treat made with colorful popcorn and salty peanuts, covered in a light, crunchy candy coating that's bursting with fruity flavor from Jell-O. Let them choose which gelatin flavor to use for a customized treat that makes a great snack for birthday parties or family movie nights. What could be more welcome on a cold winter night than a heaping plate of hot spaghetti noodles smothered in tomato sauce and topped with big, beefy meatballs? This essential family recipe for pasta and meatballs with Italian seasonings is sure to become a regular in your rotation. Kids will go bananas over this tender homemade quick bread. The batter is made with mashed ripe bananas, peanut butter powder, chopped peanuts, and mini semi-sweet chocolate chips, along with some pantry baking ingredients, and optional chopped roasted peanuts. It's a wonderful on-the-go snack. These popular, easy nachos are cooked in the microwave oven for a hearty after-school snack that can be ready in minutes. This version tops them with jalapeno peppers, cheese, and taco sauce, but you can change up the ingredients according to what your kids like.